Ok ok I’m SO excited about this post!!! Like I haven’t been this jazzed in a long time! In my heart I know that no one sets out to look like crap on the daily. 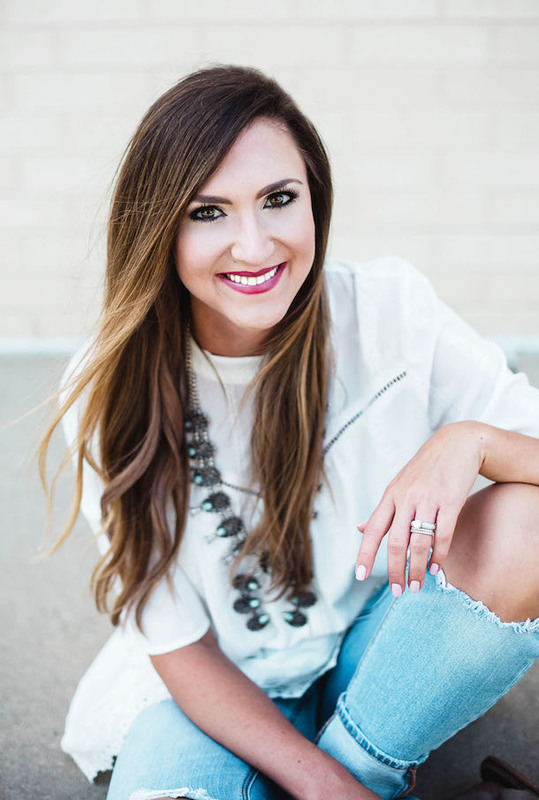 Everyone WANTS to look pulled together and feel confident, but unfortunately this season of life (aka Motherhood) doesn’t always allow us the time for that. 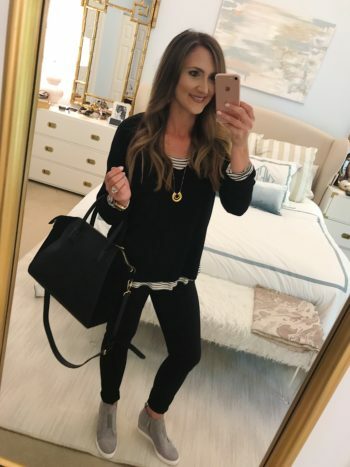 Since nothing makes me happier than seeing mamas find their confidence again, I wanted to take a lot of the thought out of putting together a great outfit on busy mornings, so I’ve created a Fall Capsule Wardrobe for busy moms! I combed through hundreds of pieces, ordered a ton of stuff to try for myself, read nearly every review, and, in the end, I kept the best of the best (all at the best prices, I might add) and am showing you how to maximize each piece. 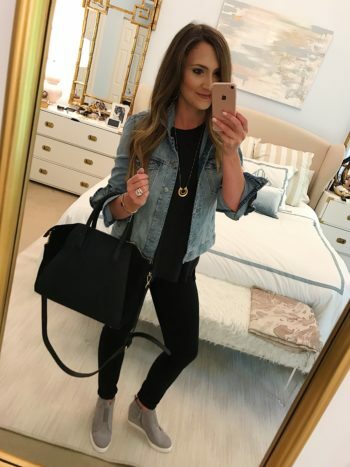 There are only 25 items in this capsule (including shoes and accessories) and I’ve created tons of “everyday chic” outfits with them to serve as a resource for you busy ladies who don’t have time to think about crafting an outfit every morning! If you’ve been here a while, you might remember that I wrote THIS POST last year and it was a HUGE hit, but I was always a little bummed that it wasn’t very visual, as that’s the way I personally like to see things. This go round, I set out to really create a visual resource for you guys to use in your day to day lives. I styled tons of looks both in flat lays and on myself so that you get a feel for the fit and flow of the pieces. 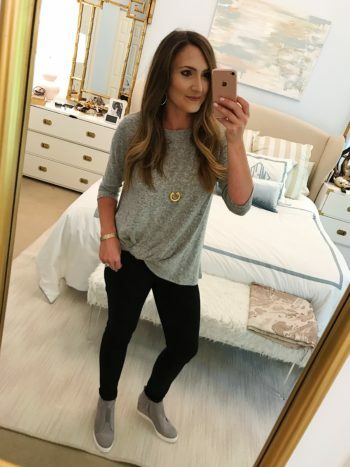 I wanted you to feel confident in that if you invested in the pieces of this fall capsule wardrobe that you will truly get your wear out of them. 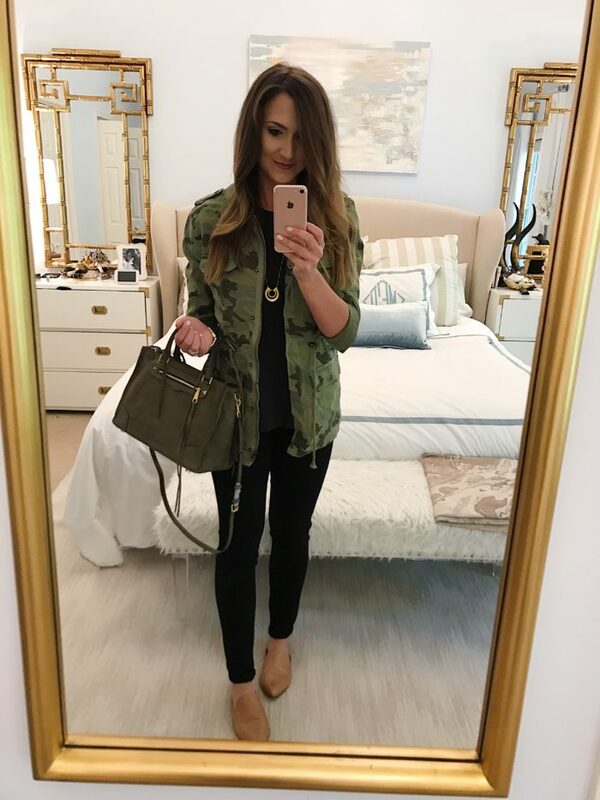 If you really wanted to make things easy and always have some inspiration on hand you could print this post out and keep it in your closet to refer back to the images when you need a quick outfit or even save it to your Pinterest boards to refer back to! I chose 3 tees all with a different sleeve length and detail to give you some variety in your basics. 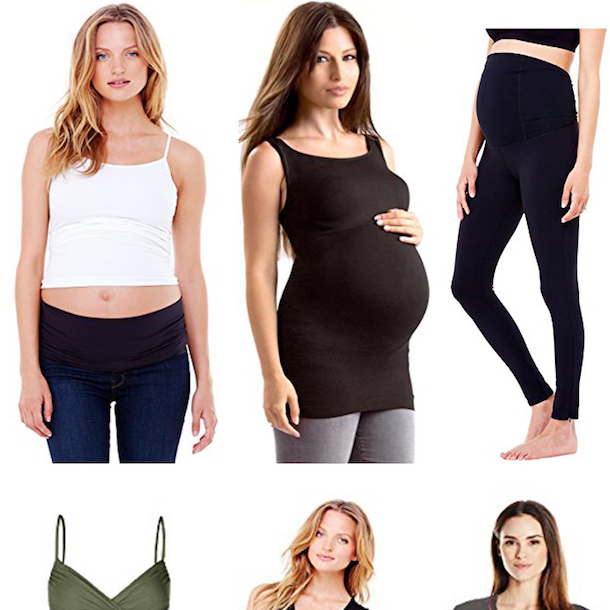 all are super soft, comfortable and great as a Fall base layer. For a step up from a tee shirt, I chose quite a few different styles that are all quite functional. Each has a fun, unique detail to make it feel a little more “elevated” and they are all still great for layering. Oh and not ONE is over $50 bucks…huge win! These Fall top layers each have great details but all work as very functional and versatile top layers as well. I own and love each and every one of these pants and highly recommend each! Each one brings a unique fit and on-trend style without being excessive! I chose one fashion color and one basic black bag but I feel like both are neutral! Both are functional for moms with a cross body strap option and both are big enough to carry kids’ junk without being too big. I could honestly ONLY wear these three pieces daily and be totally content. They go with ANY and EVERY thing and are timeless pieces that you won’t get sick of! All of these shoes are new for me this Fall and I am truly excited about each pair, but I have to tell you there are two specifically that I’m LOVING. 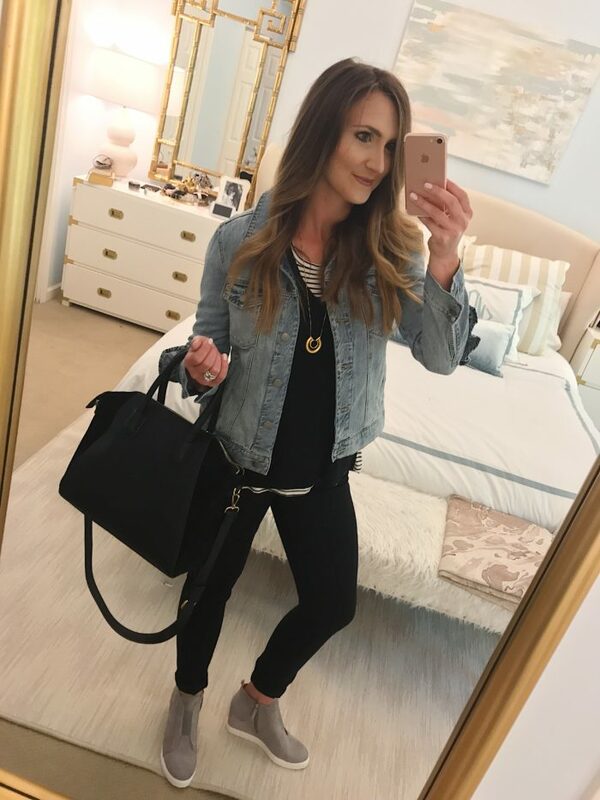 The mules and the wedge sneakers are going to be my go-to shoes for Fall and let me tell you why… They are both beyond comfortable and each is so on-trend in it’s own right. I’m already loving styling them! Here are a few ways to wear the cute little knot front sweater. Note that it’s under $50 and comes in a ton of colors. It’s so soft that you will be reaching for it daily! Here it’s thin enough to layer the denim jacket over and looks so cute with slimming black jeans. 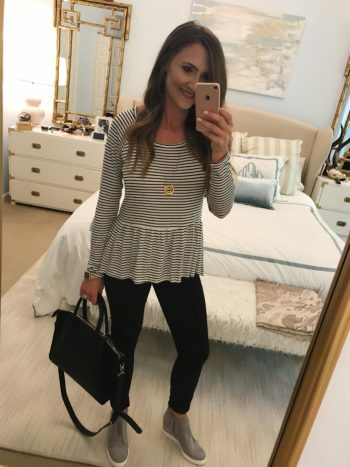 One of my favorite (and a little unexpected) ways to wear the knot front sweater was with this cute little peplum top underneath (right photo). It adds just enough interest and the peplum ruffle peeking out is just too cute. I buy this pocket tee EVERY.single.year. 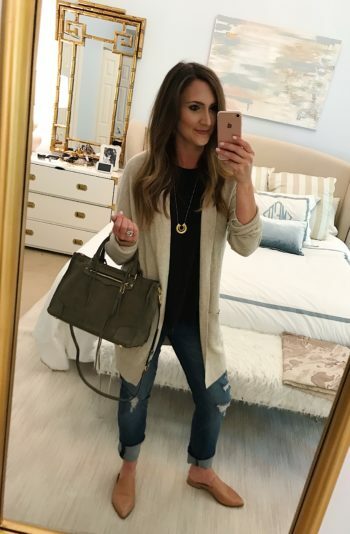 It’s the perfect lightweight layering piece for Fall and I love the slight boyfriend fit (along with the price)! I would wear it with nearly any outfit, but here it is with a basic skinny jean and slip on booties. I bought this black side slit tank during the Anniversary Sale and sadly it sold out the first day and has yet to come back in stock. I did, however, find a nearly identical version in this Black Tank for you guys. 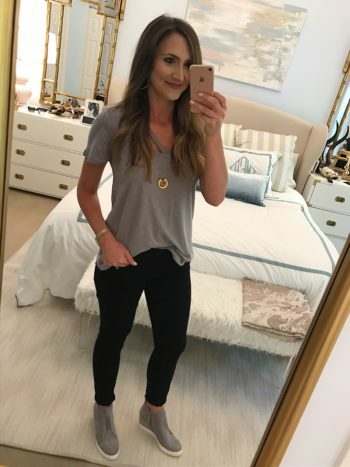 This tank is a staple in my closet because I know that it’s easy to throw on, can be layered with anything and the cut-in shoulders are always flattering. One of my FAVORITE pieces finally came back in stock and it’s this Long Cardigan ! It’s the perfect Fall layer and the tunic length lets you get away with wearing it over skinny jeans OR leggings. Size down one and buy it in two colors, you won’t regret it! Again, the all black outfit but adding the shapely camp jacket and the slides for a super polished look that’s great for Fall. 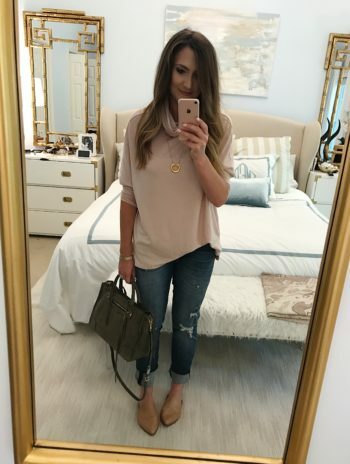 Next up, you guys know my love for this Ivory Tunic ! I really wish that I would be over it by now, but it’s truly such a great top that I think I’ll be wearing it for years to come. 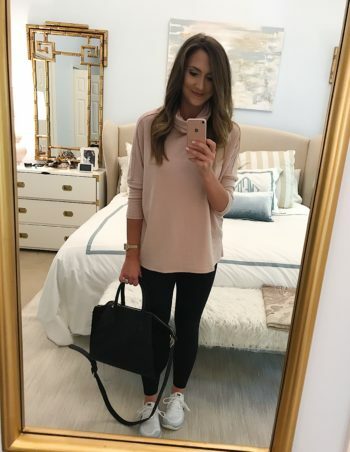 It’s super flattering and amazingly functional (see below) and under $30 in tons of colors! Here I just have it on with High Waisted Jeans and jeans for an outfit that looks pulled together but takes little to no thought to put together. 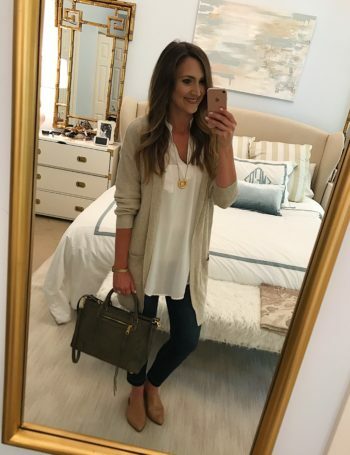 Next, we love this Ivory Tunic because it’s long enough to wear with leggings!! Here’s how to easily style it with your favorite High Waisted Leggings! 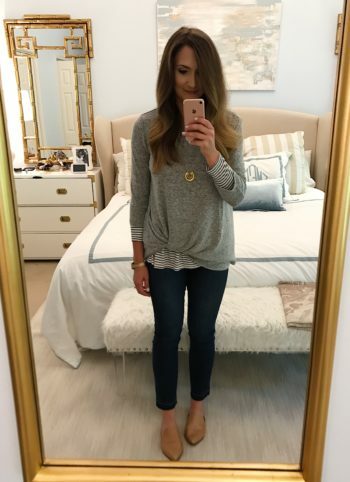 This was one of my favorite looks…simply laying the Ivory Tunic underneath the swing sweater! Next up is what I like to call an “elevated tee.” It’s got the comfort and functionality of your favorite tee shirt but THIS one has some extra style details to take it up a notch. 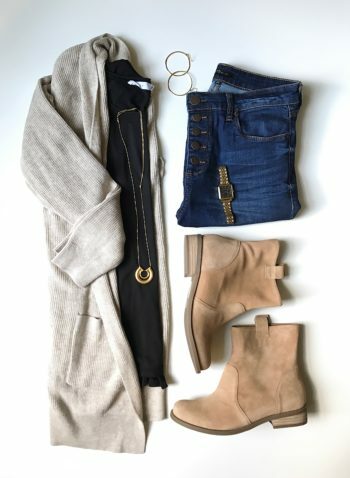 Here are some ideas on how to wear it through Fall! 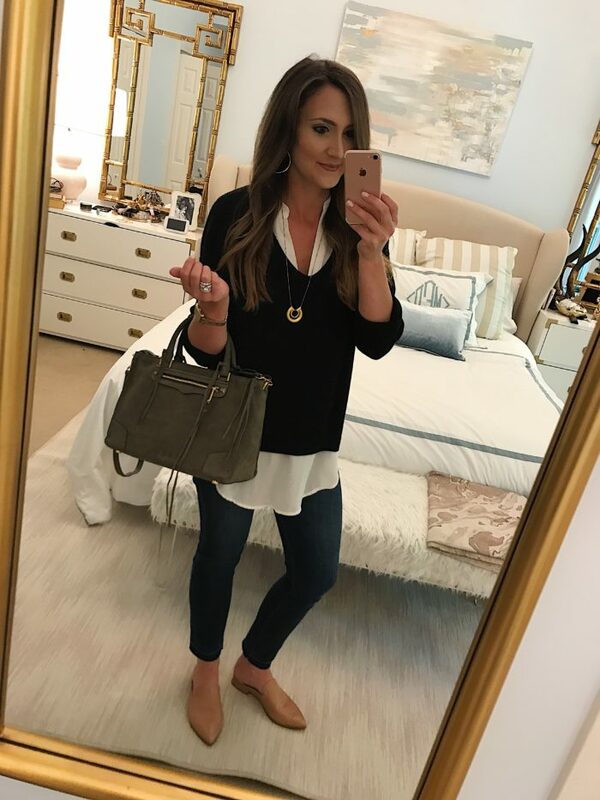 Finally this super cute (and beyond comfy) tunic stole my heart and will be on constant rotation this Fall! It’s another piece that looks really cute and requires very little effort….and it’s under $50! 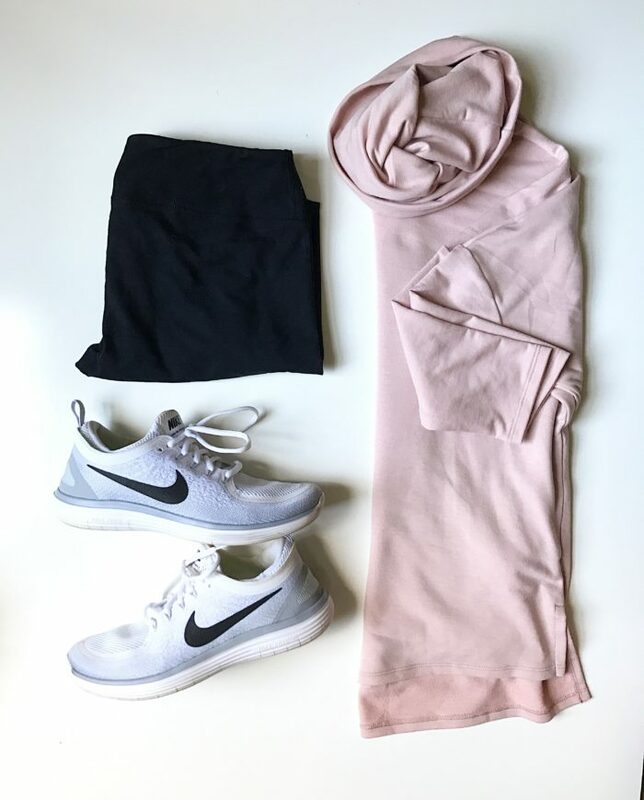 What’s also great is that it can work for an athleisure look (even worn over your workout tank) or for a casual everyday look. It comes in quite a few colors and I see it being super functional for busy mamas. 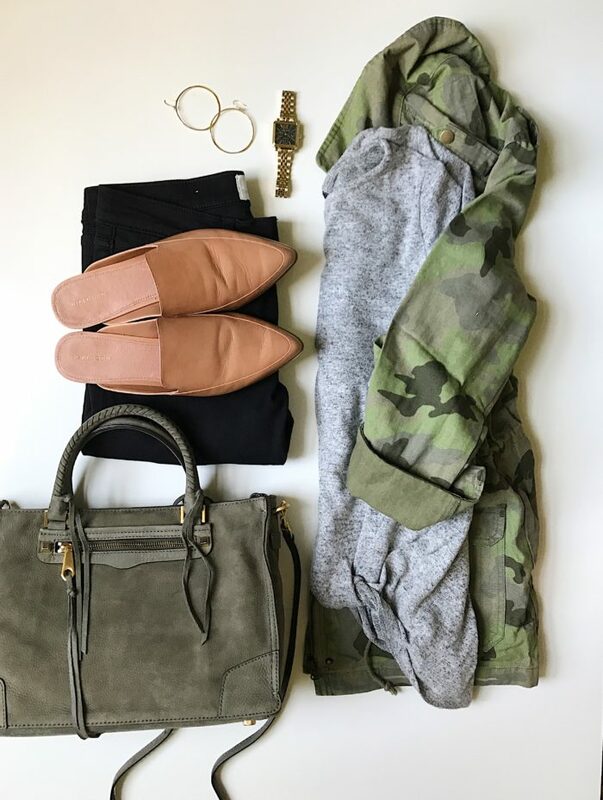 Hard to believe that I just scratched the surface with outfit combinations from this fall capsule wardrobe, right?! I could have kept going for days!!! It’s also hard to believe that ALL TWENTY FIVE of these pieces (including a designer handbag and watch) come in at under $2,000 ($1,996 to be exact). Yes, that seems like a big number, but you could literally not have to buy another casual piece all Fall! 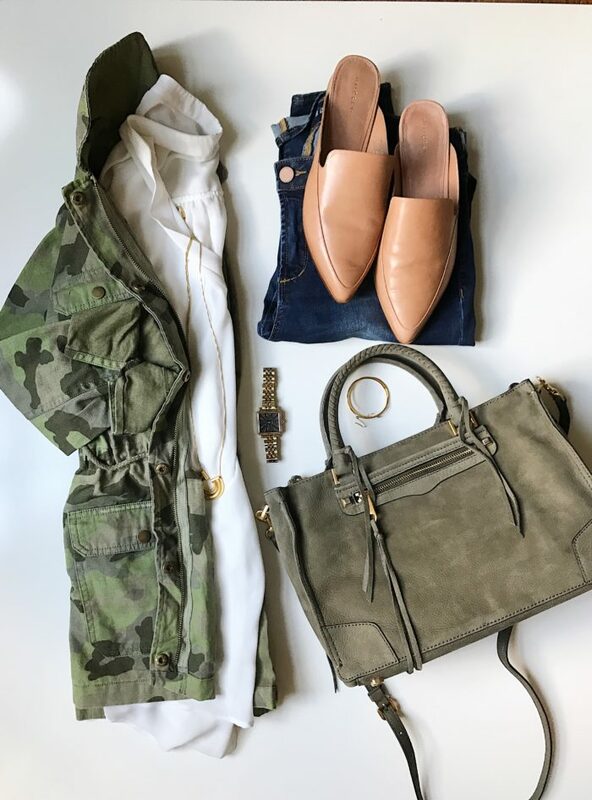 Also take out the designer bag + watch and you’re at $1,451…under $1,500 for 23 super functional pieces that can create countless cute outfits. Now, I’m clearly not suggesting you buy everything, but more or less just shocked that an entire wardrobe could be so affordable. Truth be told, I think that you guys probably have some of these things already hanging in your closet so I hope this breaths some new life into them! 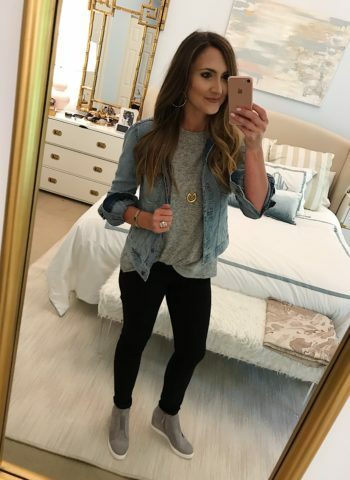 I truly hope that you enjoyed this fall capsule wardrobe post and can take away some outfit inspiration to make your mornings easier. I had such a fun time putting it all together! 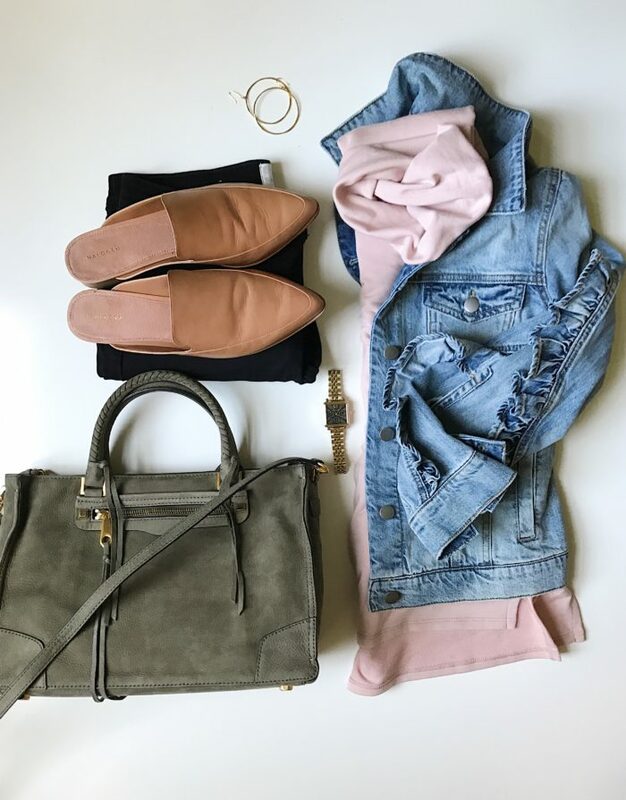 *This fall capsule wardrobe post was written in partnership with Nordstrom. I truly believe that Nordstrom is the best one stop shop for busy moms and their selection and customer service can’t be matched. When I thought through this post and who I wanted to partner with, they were the perfect fit to make things even easier for you! Please know that all content, clothing, photos and opinions are my own. Thank you for supporting brands who believe in Style Your Senses! Mallory this was an awesome post! I’m not a busy mom (yet! Lol) but I still found so much great inspiration to mix and match my closet! Great job!! SO good!!! You know I love a good capsule???????? I love all these easy combinations! Now my Nordstrom cart is so full! This is awesome! Wish I could buy it all. Thanks for the cute and functional outfit suggestions. You make it look so easy to mix and match, but it’s not! I appreciate the help! best.post.ever. this is so amazing, thank you!! i LOVE capsule wardrobes! Your capsules are my favorite posts each season! 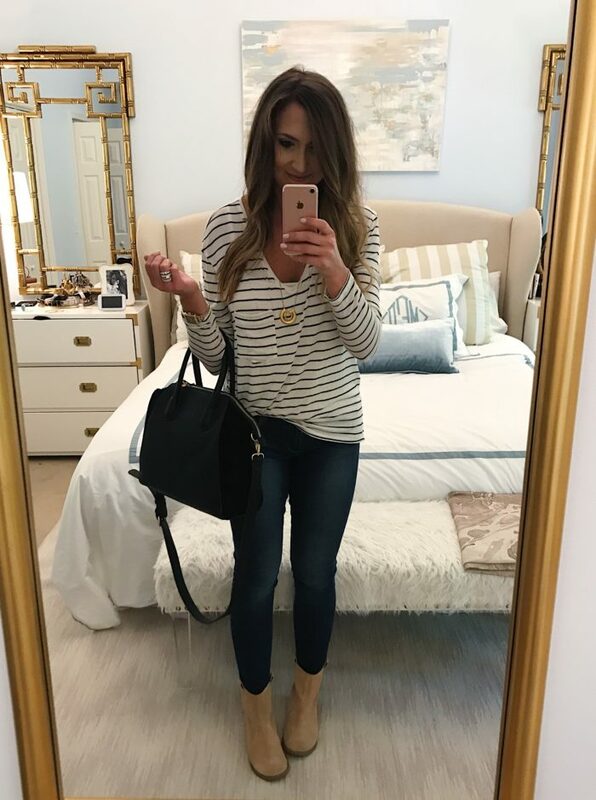 First time mom with a 3 week old and I love your blog for affordable pieces that even look great PP! Something about capsule wardrobes just make my minimalist heart happy and there’s several pieces here I already have and others I plan to get ASAP. Thank you for putting this together! I LOVE the peplum/twitst front combo! Did you get a medium in both pieces? Great post!! I bought three pieces today and I was bummed that 2 of the pieces are out of stock. Thank you for such a great well-thought out and put together post. I want to print all the pages and put them in my closet for reference. Bravo! Oh loved, loved, loved this post. From one Charlotte mamma to another, thank you! Love it!!! Thank you for taking so much time and putting so much thought into this! Thanks for your post! I bought a lot of these pieces during sale and appreciate your suggested outfits. Please post more stories like this!! Always ready to see new perspectives on clothing choices! Yea for busy moms!! 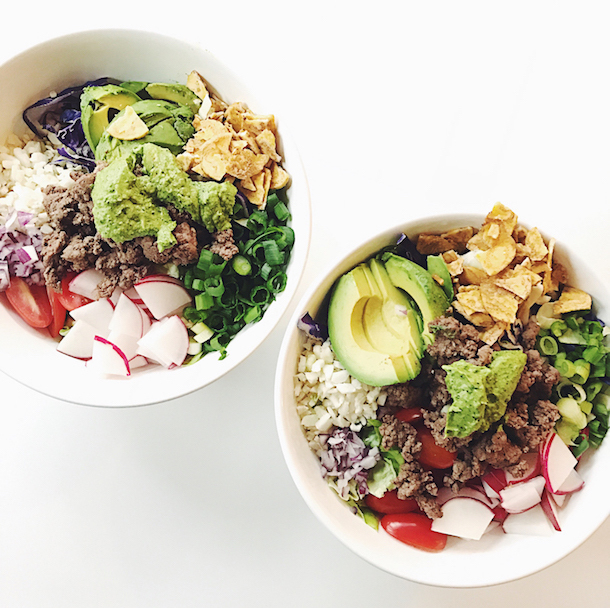 New subscriber here – absolutely LOVE this post! I hope you’ll do one for each season! Thank you for this post! I just had my first baby in January and I’ve definitely neglected my wardrobe since then. I’m ready to get back on track and this post is the perfect starting point for me. I already have many of these items in my closet (or similar items) so now I’m so excited to style them. I would have been lost otherwise. Great post! Elisa- this makes me so happy! I’m thrilled that you liked the post and am so happy that you already had some of the pieces ready to go! Cheers, mama! how much for all the pieces? This was a great post Mallory! I appreciate you finding us some great new pieces as well as giving inspiration to incorporate similar pieces already owned with the new things! I’m looking forward to wearing that Gibson knotted sweater, the Gibson sweaters are sooooo soft. I’m thinking about those wedge sneakers also! So fun! Are they pretty comfy?? LOVE! and have a few of these pieces already. Great post, thank you! Hey beautiful lady! I have been following your blog for some time and have really enjoyed your posts. Thank you for this awesome post on the fall capsule. I very much appreciate the amount of time you put in that showcases all of the different outfits (and the pictures!). I am a first grade teacher and I am so excited to wear the majority of these outfits. I purchased the Ivory Tunic, High Waisted Leggings, Grey Knotted Sweater, and Black Swing Sweater. I went to Nordstrom Rack and picked out similar earrings and necklace to complete the look with things I already had in my closet. I loved the mules but they had sold out of my size. Maybe next year I can snag them!! I’m not a mom (yet), but I found so much inspiration in this post! 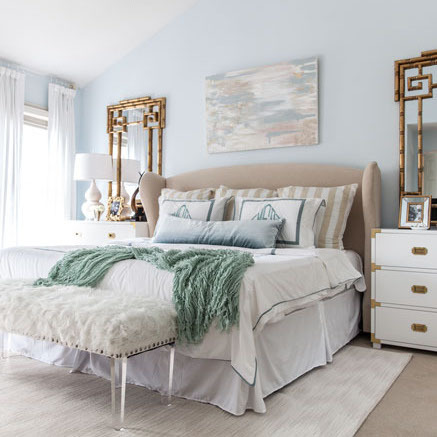 Love your style and the ideas you have to mix and match!! Great post! Now that I’ve had my babies, I’m doing a capsule wardrobe!! Thank you for showing the pieces you pickedandactual outfitstbat they make. Brilliant! So resourceful. Always happy to shop @ Nordstrom so as a busy/professional Momma of littles this was a perfect fit. Will be ordering many of your suggestions! Just to clarify…you really do find those mules comfy? And easy to shuffle around in?? Do you think the cognac color is more versatile than the leopard that also comes in that style? Just curious. Yes, totally comfy! Took a little while to get used to a new shoe fit (sort of like when you wear flip flops for the first time after winter), but 100% functional! I debated between the cognac and leopard soo hard, but in the end I do feel that the cognac was more versatile. That said, I will probably cave to a leopard pair soon because I have zero self control. Ugh! i just purchased some mules and i have some cardigans, but lord knows i need some GOOD denim in my life (currently working on it). i absolutely love seeing what others have as their staples in their closets..both for every day life and for seasons. also can’t be a great designer handbag that you can transition into any part of your life. for all the money i’ve wasted on crappy bags that start to come loose at the seams after time, i could have a prada bag or a LV neverfull by now..but i’m slowly learning! i’m also slowly learning that nordstrom REALLY is a great place to shop for EVERYTHING. thank you for taking the time out to do this. it really do intrigue me to see what other people see as their staples. lord knows i need help haha. Thank you so much for this post, all of the outfits are so cute! 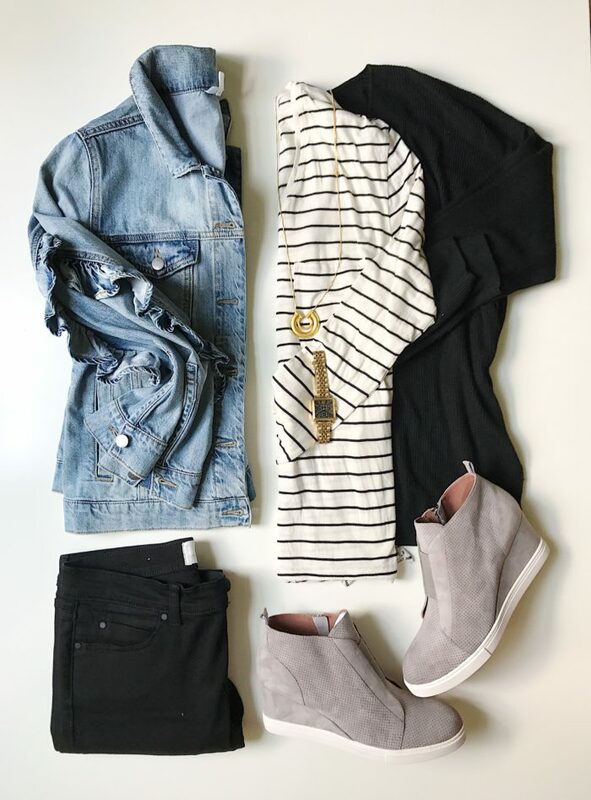 Do you have any other recommendations for the grey wedge sneakers since the pair you got are sold out? Thanks! 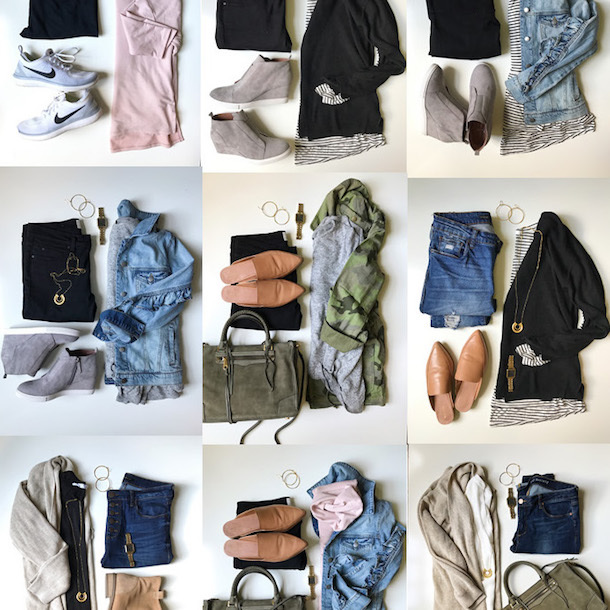 Just found your blog- and I LOVE LOVE LOVE this capsule wardrobe! 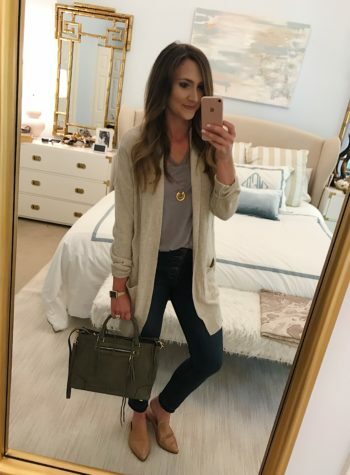 It is a great way to see what pieces I should add this fall, and I love how you put everything together in outfit ideas. I ordered the wedge sneaks, the mules, and a bunch of the tops (oh and also the wit and wisdom favourite jeans from your other post). Please do more capsule wardrobes in the future! I live in Canada and I would love a cold weather/ winter capsule at some point. Love your style too- everyday casual/mom/cute/running around/ kids activities/ etc. Just what I need! P.S. Do you do any online personal style consultation or shopping? I would love to use your services if you do! Oh and I also ordered the RM satchel in the green- it was out of stock at Nordstrom but I got directly from RM website and even got a 15% off discount code! I can’t wait to get the bag!!! Love all these ideas- I’m a little late to the game and several items are out of stock- do you know if they will be available again? Thanks! Love the post! 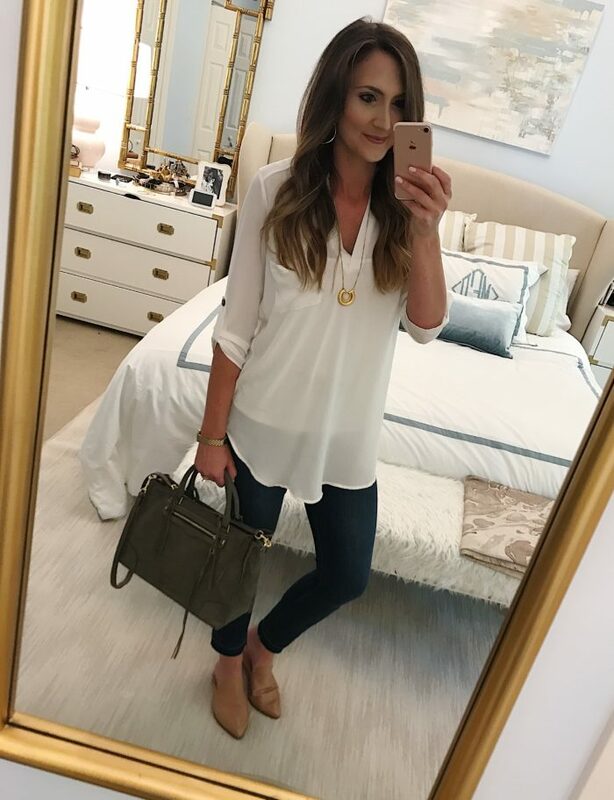 What cami do you wear under the white tunic blouse? Man this is probably the best capsule wardrobe post I’ve seen. 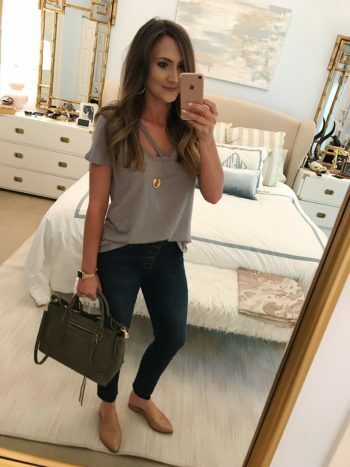 I am also 5’9″+ and a mom and I am at a place where I want to look nice all the time but have to have clothes that are sturdy enough to survive my 2 year old. 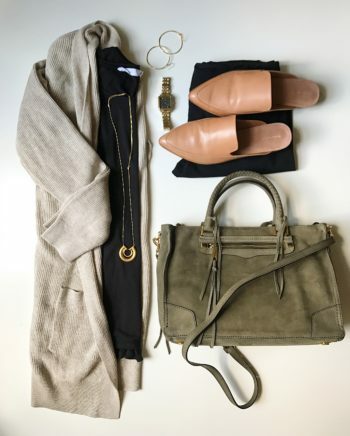 These outfits are stylish, trendy and neutral which I love. Also appropriate for a woman’s body lol. Those Pinterest rompers and booty shorts are killing me! I’m sorry, just not trying to put all my junk out there like that. I will certainly be picking up those wedge sneakers and I’m loving that purse too. Actually I like nearly everything! One tip I wanted to share for those who may need to squirrel away some cash to upgrade their wardrobes is to try consignment. Rather than donating my nicer clothes, I consign at local shops and get 50-60% of the sale price. It takes some work, but I save that money and put it toward new items…guilt free. Also, Swap.com has worked nicely for me too, for items that high end consignment shops wont take. LOVE, LOVE, LOVE this post!! I had been looking for some inspiration to look more pulled together for work, weekends and for my children’s events. I don’t often think of putting different items together and you have inspired me. I had a few similar items in my closet and I did buy a few pieces with my commission. Can’t wait for it to arrive and get out there looking cute! Thank you so much. I’m now a subscriber. Can’t wait to see more! I LOVED all of these pieces. So sad that every single item I wanted was out of stock and some no longer available! Boo! Great post though. This capsule is amazing!!! I love how you worked all of the pieces to mix and match together. I will definitely be using this all Fall and Winter and truly appreciate all of the visuals. Thank you so much for sharing your creativity and style! 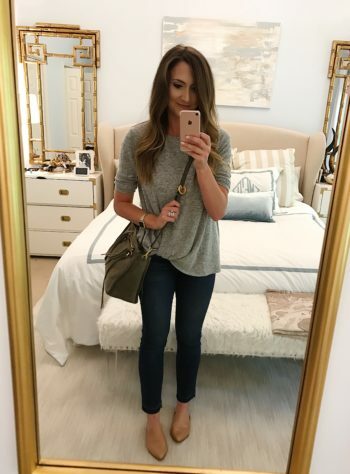 I am slowly reworking my wardrobe into almost all neutrals and love the ease and versatility. Thank you so much!